There seems to have been quite a few new iOS game releases this week, but this post focuses on what we feel were the best and/or most promising looking new titles of the week. 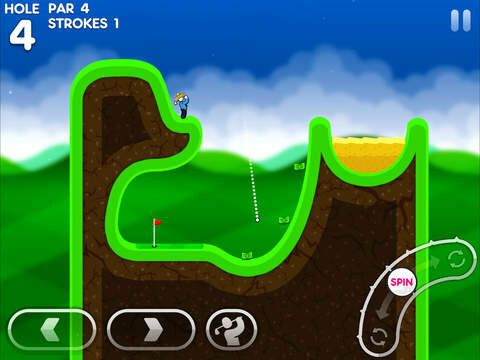 We’ll start this week with Super Stickman Golf 3, the latest game in one of my absolute favorite game series on iOS. When I heard that Noodlecake was going to be releasing a third Super Stickman Golf game, I wondered what they could possibly add to the series other than new courses. Well, in addition to new courses, the game introduces an awesome new game mechanism…SPIN! Now players can put clockwise or counter-clockwise spin on the ball adding a whole new level of finesse and strategy, allowing players to pull off some impressive shots without even needing to even dip into their bag of special power-up balls. It gives the game a much more clean feel and makes for a completely fresh experience even on courses that may seem somewhat familiar to long-time fans of the series. The whole hat and prize machine system of SSG2 have been completely streamlined, with players earning or buying packs of cards which can award them with XP, help unlock new ball types, unlock purely cosmetic suits or ball trails and unlock special ability hats. That’s just the tip of the iceberg, there are also loads of fun new multiplayer race variants and daily races with rewards as well. The game is free to download and a single $2.99 IAP (an insta-buy for me) unlocks the full game, removing all ads and gives players five bonus card packs, unlimited tries on daily races, access to all downloadable courses (now and future) as well as the ability to have up to 25 simultaneous turn-based matches. So, so good, a MUST HAVE! Already causing a global phenomenon, the highly anticipated Pokémon GO finally hits the App Store. 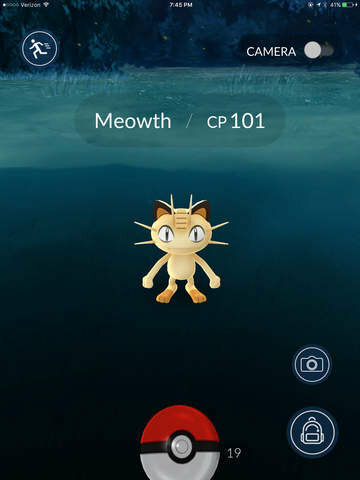 Using a combination of GPS and camera for augmented reality, now players can catch, hatch, train and evolve virtual Pokémon in the real world. Take a walk around your neighborhood find a Pokémon throw a Poké Ball and catch’em all (151 at launch). Discover and visit special PokéStops (found at nearby museums, historical markers, monuments, etc) and stock up on Poké Balls and other items. Find a Gym and battle rival Pokémon to defend it. The app is currently having some big login issues, but that doesn’t seem to be stopping the rabid fans from getting seriously addicted to this one. 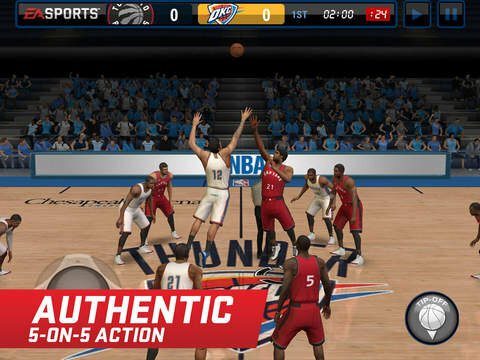 Electronic Arts has released their first-ever mobile edition of NBA Live, appropriately called NBA LIVE Mobile. Though those looking for more of a one-to-one correlation with console versions will be sorely disappointed. Instead EA has gone for a more neutered version of the game kind of like they did with MADDEN NFL Mobile. While there is “some” arcade basketball, compared to EA’s previous mobile basketball property, NBA Jam, this gameplay feels very limited, vanilla and not very compelling. The game offers players 5 on 5 match-ups with two-minute quarters. There are three modes of play, modes of play: ‘Season’ where you compete in 14 games against AI opponents. Depending on how well you do in the regular season, there is a 3-game playoff and a final. You can also compete in limited time ‘Live Events’ to earn rewards or go ‘Head to Head’ against another player. Despite all of this, at its core, the game seems to be less about the basketball itself and more about building up your personal team’s roster through the acquisition of card packs…after all, this is a free-to-play game and EA needs to make money somehow. Packs are gained either through purchase, trade or rewards. You can select your favorite team, but you aren’t going to get the complete NBA roster for that team, instead you get a whole bunch of random, low-rated players that’s you’ll swap out over time. For me, the game can’t hold a candle to NBA Jam, but I suppose if you just want a basketball game, but don’t want to spend $5 then this freebie may will have to be good enough. 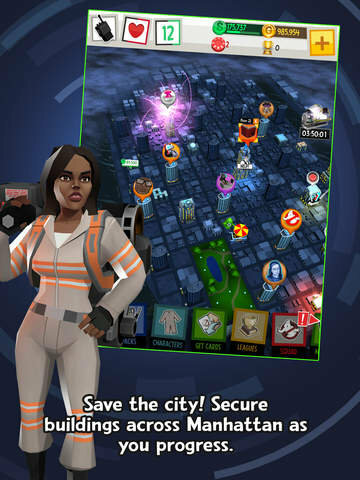 Released by Activision Publishing is a new free-to-play Ghostbusters game called Ghostbusters™: Slime City, which is based on the characters and universe from the upcoming third (and somewhat divisive) Ghostbusters feature film. Way back in 1984, Activision released the very first Ghostbusters video game (one that I very fondly remember from my youth) and this latest offering, while much more polished, modern (and free-to-play monetized), evokes some memories of that tile. New York City has been overrun by paranormal activity (as it seems to have a habit of doing) and you, the latest Ghostbuster recruit, must prove that you’ve got the skills and help capture ghosts and other spooks to save the city. When calls come into GB HQ, you’ll go out on ghost capturing jobs where you need to blast and trap ghosts with your proton pack. You’ll earn money and rewards which allow you to customize equipment, securing additional buildings around Manhattan and upgrade your headquarters. Whether or not you have strong feelings about the upcoming film, this looks like a game that any Ghostbusters fan should enjoy. 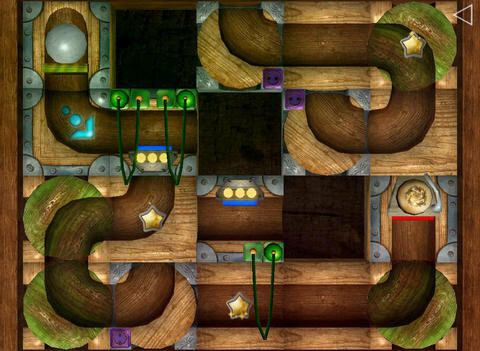 A somewhat unassuming little physics puzzle game, don’t let Marble Machine – A Puzzle Game fall under the radar. In each level, you must rearrange tiles, each of which have tunnel segments, to create a tube that a marble can take (hopefully rolling past all three stars) and reach the exit. New elements are introduced at a good pace to keep things interesting. You have to deal with gravity by properly placing accelerating segments, segments with switches, rotating segments and more. The game is free to download, allowing you to play through 30 levels, then there are various “pay what you want” IAP options allowing players to pay as little as $1 to $10 to unlock the entire game. From the creators of Redline Rush and Blocky Roads comes Dead Venture. 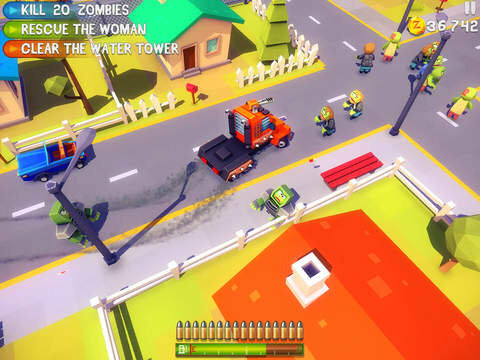 Have fun mowing down loads of zombies with your car as you try to defend the human race against hordes of the undead. The game features a nice variety of zombies, not just your standard walking dead. Upgrade your car to make it more durable, faster, have more gas or a bigger better weapon. The lengthy story mode is a blast as you try to complete a rolling set of missions. Head out into the infected town trying to cause as much carnage as you can before you run out of gas or take too much damage. Each cycle takes up one days worth of time in-game and you are trying to complete the entire story mode in the least number of days. Once completed, you can re-try the Story Mode to see if you can complete it in less days. Beyond the entertaining story mode there are also Time Trial and endless Survival modes. Dead Venture is one of this week’s fun little surprises, there is just something really satisfying about mowing down zombies with a car. Well done. This week there were a couple of interesting branching fiction apps released. First up is Deadman Diaries from the talent team over at Cubus Games, who have a history of really solid Gamebooks with a catalog that includes: Heavy Metal Thunder, Sol Invictus and Necklace of Skulls. 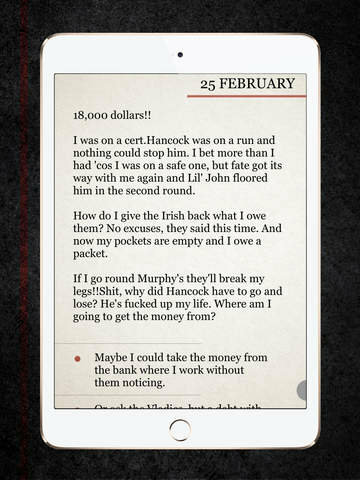 Their latest offering appears to be a bit of a departure from their usual sci-fi Gamebook fare; setup as more of a personal diary, the player gets to make life and death decisions for the main character John Riggs, a bank worker who has to pay off a gambling debt that inevitably leads him to a variety of deadly, illegal, situations. Will you save him or “send him to the largest imaginable number of deaths”. Deadman Diaries has a compelling black and white look to it. Its authors say “this story presents a contemporary ‘black’ and neo-noir thriller drawing from referents like the cinema of Scorsese and the Cohen Brothers, and TV series such as The Sopranos, without ignoring the influence of the most classical cinema ‘noir’ and the thrillers of James M.Cain and Patricia Highsmith”. I believe its current 99¢ price tag is a special launch price. 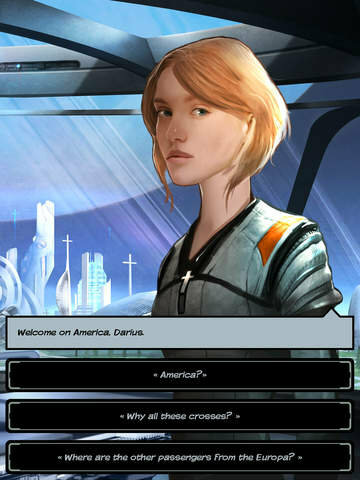 Out There Chronicles is an interactive graphic novel by Mi-Clos Studio, based in the award-winning Out There universe and set several million years before the time of the original game. “After a slumber of a million years, you wake up on America, a planet colonized by humans who fled the Earth. In your quest to find your people, you’ll set off on a galactic adventure where you’ll meet a host of colorful characters and visit unimaginable locations.” Written by FibreTigre, and beautifully illustrated by French SF artist, Benjamin Carré, this looks like a really intriguing story. Finally, we’ll end this week with a digital board game port. 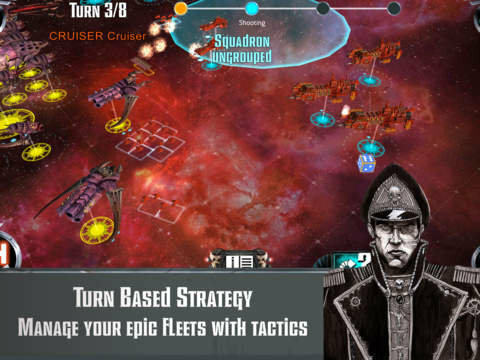 The debut game release by Lyon, France based Grand Cauldron, Battlefleet Gothic: Leviathan is a faithful digital adaptation of Games Workshop’s 1999 space battle tabletop miniatures game, Battlefleet Gothic, set in the Warhammer 40,000 universe, during the 40k Shield of Baal campaign. Players get to dive into immense space battles, commanding fleets of “spaceships from the Imperial Navy, the Space Marines Blood Angels or the Tyranids”. The digital implementation of this turn-based tactical strategy game features both online and local (pass and play) multiplayer offerings. I’m not familiar with the original tabletop game, but this looks like a solid new Games Workshop mobile offering. That’s all I have for you this week…enjoy.